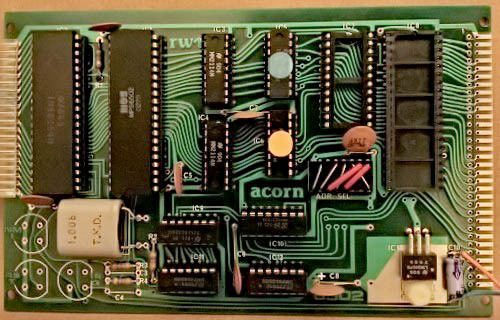 This site has been created in order to preserve a piece of computer history – Acorn Computer’s first public offering, the Acorn Microcomputer (later known as the Acorn System 1). The one pictured below was shipped on 9 April 1979. In addition to describing the computer, I have written an Emulator for it – so you can try it for yourself even if you don't have the original hardware. 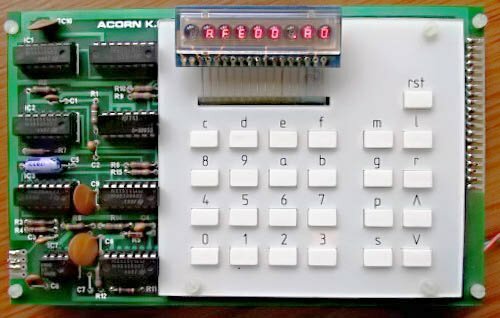 You might find the emulator useful as an educational resource, too, as it really shows how to program a computer at the hardware level (and with the mini-debugger you can watch the registers and other internal state changing as instructions are executed). Many thanks to Fabio Arpino for improving the images here. In addition to the white keyboard, this board also holds a 9-digit calculator-style 7-segment LED display (of which only 8 digits can be used) and, on the left, circuitry for the cassette recorder interface (and a scan decoder). Here's a simulated recording of the first 128 bytes of the Acorn Monitor program, as would be recorded on a cassette tape (your browser may need a plug-in to play this MIDI file). In this picture the display is showing the contents of the memory location at address (A.) FE00, namely A0. This is the first byte of the firmware monitor program. The rst key resets the microprocessor, which starts the monitor program (which in turn initially displays eight dots, then waits for a command key to be pressed). Along the bottom are sites for interrupt switches (NMI, RST, IRQ), the 1.006MHz crystal, circuitry for address decoding and chip selection, and (at the bottom right) an LM340T5 5-Volt regulator. 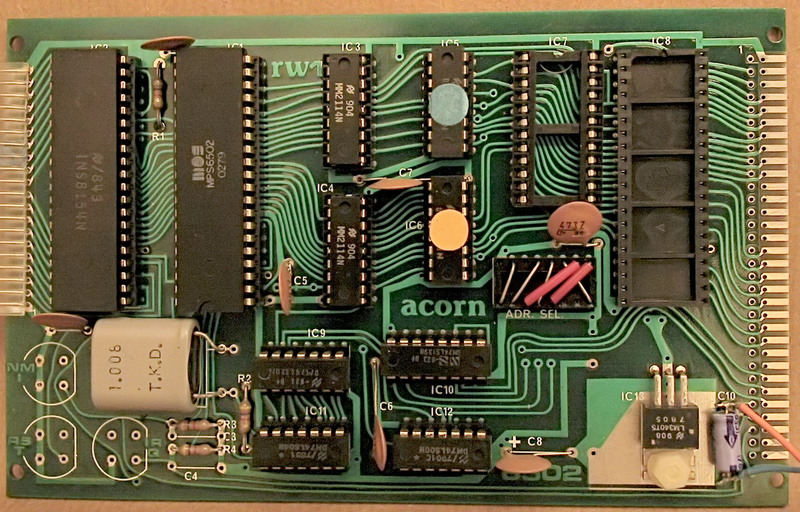 The board was also marketed as a ‘Single Board Controller’ without the RAM and ROM chips. This site was constructed by Mike Cowlishaw. Please send me any corrections, suggestions for improvement, etc. Photographs and HTML text © Mike Cowlishaw 2001, 2002.